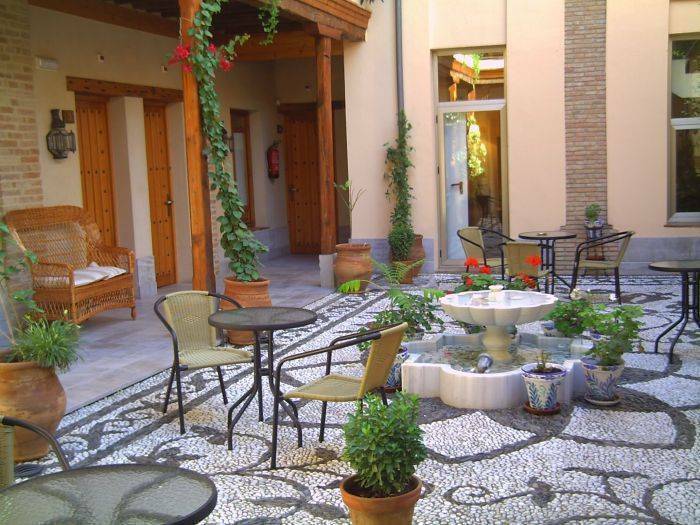 Abadia Hotel Granada ... 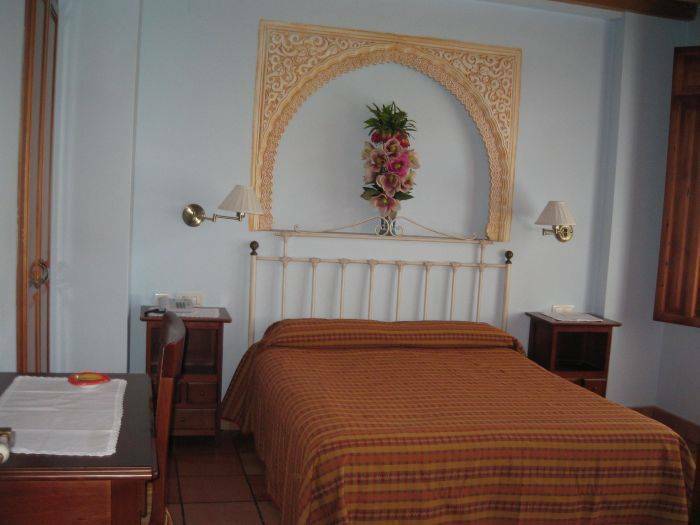 Very nice hotel in the very center of the town, comfortable and clean, the personal very professional and willingly to help you for every thing you need. The New Abadia Hotel, with its ancient 16th century style house and patio, is one of the most enchanting, romantic and fabulous hotels you will find in all of Spain. 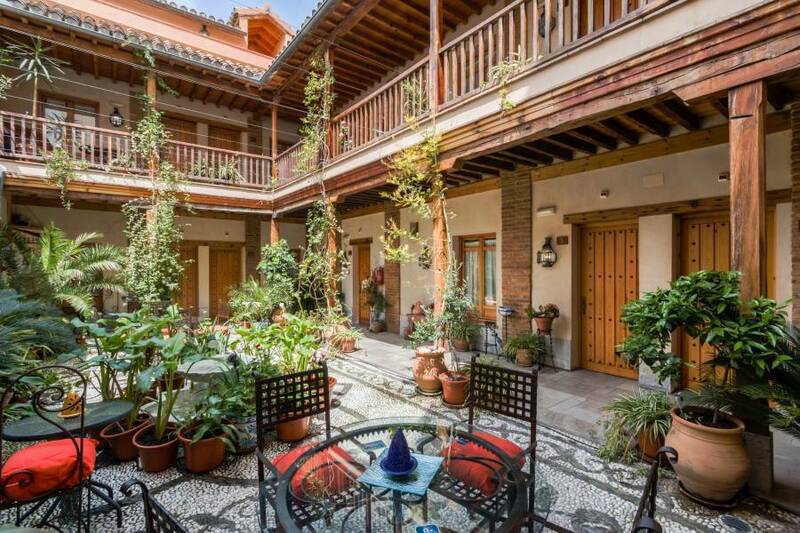 It is situated directly in the middle of the cultural and commercial center of Granada (three minutes walk to the Cathedral and barrio Albaicin and five minutes by bus to the magnificent Alhambra). We are proud to offer 19 fully furnished rooms with television, telephone, minibar, Internet, individual air conditioning or heating, and a complete bathroom with hair dryer, bath products and one room with Jacuzzi for an extra cost of 30 € upon the standard room. The apartment with one bedroom is 500 meters from the hotel. Parking facilities for 14 euros the night. Limited space, we recommend to book in advance. Please note that reception opening hours are from 07:30 until 24:00 from Sunday to Thursday. Week-end 24 hours staffing. Guests arriving outside reception opening hours are kindly requested to contact the property in advance, using the contact details found on the booking confirmation. By car: From the ring road of Granada A-44, take exit 128 CENTRO -Mendez Nunez. Then go straight to Avenida Fuente Nueva and Severo Ochoa. Turn on your right, 100 meters after the hotel CENTER and then take the first street on the right called RECTOR LOPEZ ARGUETA. At the end of the street turn left and take San Juan de Dios street: then take the first street on your left (Ventanilla) and then again the first on your right. There you will find Triana Baja street and ABADIA HOTEL. Once you have your bags unloaded, we recommend you to park in the Abadia hotel parking for 14€ the night. Or alternatively, leave your car in the public parking "Triunfo". The cost is, aproximately, 20 € for 24 hours. Taxi will cost around 8 € or take bus SN2 & LAC and get off in Gran Via Avenue on the round about with the big flag of Spain, near PADRE SUAREZ School. Walk down SAN JUAN DE DIOS street, take the third on the right(Fuente Nueva) and first left, you are in Triana Baja and Abadia hotel. From the Airport, take a taxi (cost 30€), or shuttle (cost 3€) to Gran Via Avenue on the round about with the big flag of Spain and Padre SUAREZ School. 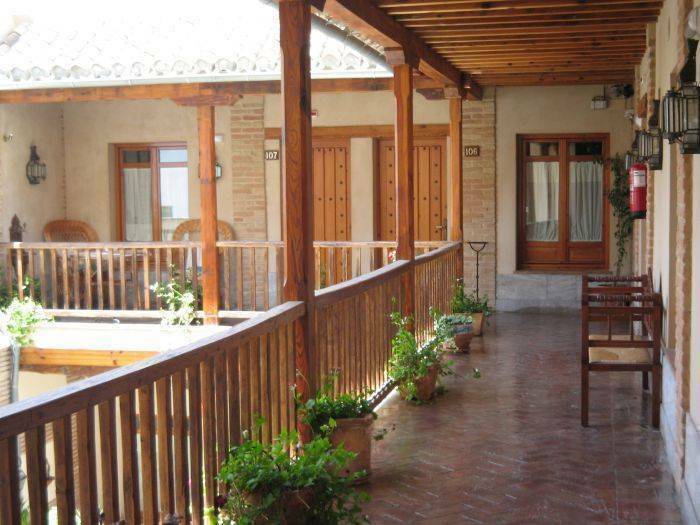 We are pleased to offer you an apartment that has all the characteristics of an andalusian patio. It is located 1 minutes walking from Gran via Avenue. It is new built and it has similar characteristics like our hotel. 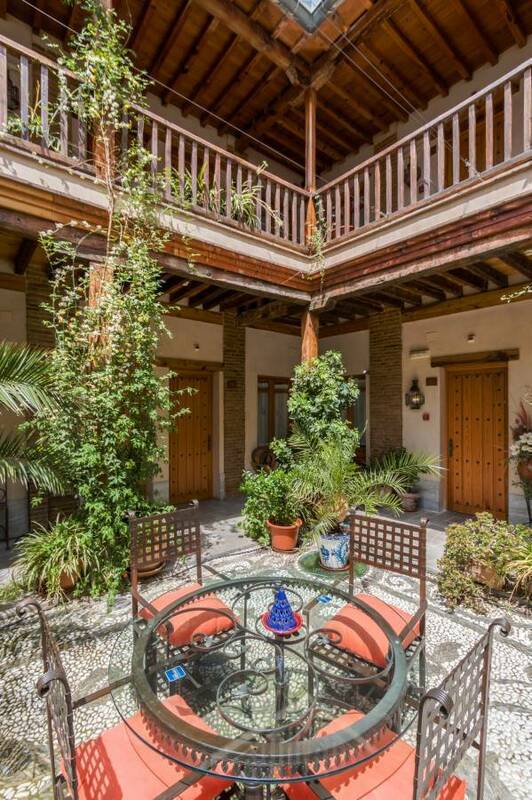 It complies with the authentic style of the architecture and history of the city of Granada. The reception is situated in the Hotel Abadia on Calle Triana Baja n 7, in 500 meters from the apartments. 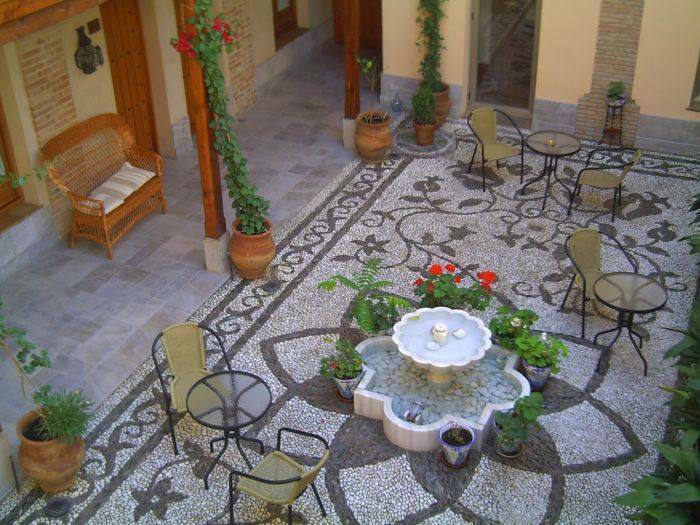 Grand patio- with its fountain and foliage, it is an oasis of peace and tranquillity. Relax in the peaceful environment while listening to the murmur of the Nazarene fountains water. Enjoy reading a book or other activities in the patio. 5 minutes from the Alhambra by bus. At least 48 hours before the day of arrival. Otherwise, the hotel will charge the amount corresponding to the first night on the credit card.